This type of air-raid shelter was designed by David Anderson, B. L. Hurst and Sir Henry Jupp based on the 1938 prototype created by William Paterson and Oscar Carl Kerrison. 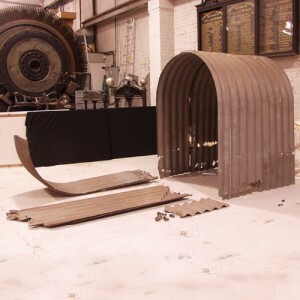 The galvanised corrugated steel shelter, designed to be constructed in a four-foot deep hole in the garden, consisted of 14 panels bolted together, 6 curved panels at the top, 3 straight sheets on each side and one straight panel at each end, one of which contained a door. Once built, the shelter was 6′ high x 4′ 6″ wide x 6′ 6″ long and could accomodate 4 to 6 people. To complete construction it was intended that 15″ of soil be distributed over the roof of the shelter. More than 2 million shelters were put up during WWII. For those on low incomes they were issued free of charge but for those on higher incomes the Government levied a charge of £7. The shelters were named after Home Secretary, Sir John Anderson, who was responsible for civil defence in 1938.